HENLEY 1sts ran out winners in their Premier Division 1 relegation battle with Milton Keynes at Jubilee Park last Saturday. Going into the match Henley were bottom of the table with Milton Keynes one place and point above them. Henley started brightly as Mortimer made his way into the opposition’s half and won a short corner. A good manoeuvre from Foster allowed him to slip the ball to Hetherington who fired it into the far right corner to give Henley the lead. The first 25 minutes of the second half was uneventful with Henley having room to play but not managing to convert any goals. Milton Keynes kept upping the pressure and eventually brought off their keeper with five minutes remaining to replace him with a kicking back. One of many attacks, against Henley saw the hosts midfielders help the defenders out from the onslaught. Jonny Taylor tried to slow the game down with a tackle on a Milton Keynes midfielder that resulted in him picking up a yellow card and sin binned with two minutes of the match remaining. Henley defended another attack into their D and cleared the ball into the middle of the pitch. Seeing an opportunity to break, Matt Riches took off up the field with Landy following close behind and Soulsby adding additional support. Following a good passing move, Soulsby played the ball back to man-of-the-match Riches who wrapped up the points with Henley’s second goal of the match. 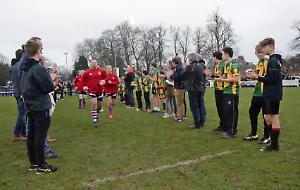 In the last minute of the game, Mortimer was issued a yellow card for a tackle and, facing a late short corner, Henley held out for their second win of the season. VETERAN forward Tim Barrass delivered an exceptional performance to inspire Henley 3rds to a 3-1 home victory against local rivals Sonning 3rds. Henley got off to a sluggish start and, with the exception of Barrass, execution across the pitch was initially lacking, with possession regularly being wasted and turned over to the opposition. The defensive unit held fast and the Henley goal was rarely threatened other than through a series of Sonning penalty corners, which goalkeeper Joe Sylvester and accompanying defenders resisted stoutly. Winning the greater share of possession, Henley gradually gained the upper hand and finally converted possession into the lead, when a miscued cross from Mike Woolfrey was pounced upon and tidied up by Barrass, who used his skill to beat two defenders and drive the ball home with an impressive finish. Early in the second half a rare defensive error resulted in a Sonning cross to an unmarked attacker at the far post, who took the score to 1-1.
Henley regrouped, transferring the ball quickly across the pitch. Jack Draycott found Barrass, who bamboozled three defenders with a mazy run to win a short corner, which Mike Woolfrey duly converted. Another fast move led to the third Henley goal. The impressive James Rechner found Barrass, who resisted the attention of four defenders before delivering a neat lofted pass enabling Andrew Foster-Yeow to beat the goalkeeper. Sonning started to lose discipline with two players sin binned for indiscretions, with Henley closing out the win comfortably, nearly adding a fourth goal when man-of-the-match Barrass delivered a sharp undercut strike from the top of the area, only denied by the crossbar. HENLEY 4ths put in a five-star display as they eased to victory at Phoenix and Ranelagh 3rds. Having been depleted in the last few weeks, Henley were back to their full-strength squad and right from the off the attacking trio of Tim Cima, Andy Farrow and Ewan Watkins were at the Phoenix defence, and on more than one occasion proved too hot to handle. Cima got the breakthrough goal with a fine shot from the top of the D. The rest of the first half was dominated by Henley pressure, and good all round defensive work meant that Phoenix’s only form of attack was long balls through the defence. Henley turned on the style in the second half. A good attacking move saw Ian Rechner supply a long ball down the line to Farrow who squared back to Cima who slotted in for his second goal of the game. Minutes later, Henley stunned the home side with a carbon copy of the second goal, once again Cima was there to slot home and get his hat-trick after 45 minutes. The amber and blues didn’t cease in their hunt for goals, extending their lead to 4-0 as Laurence Marshall supplied a slicing ball through the heart of the defence for Ewan Watkins to calmly slot home. Despite conceding a counter attacking goal, against the run of play, the four goal lead was restored before the end of the game, as Watkins beat two defenders down the wing and squared to Cima for his fourth goal of the game. Prior to this match, Phoenix had only conceded seven goals all season. The win for Henley moved them up to sixth place in the table. HENLEY 5ths crashed to a 2-0 defeat at Eastcote Eagles’ Northold ground. The visitors fell behind to an early goal in the first minute of the match. Following this early disappointment, Henley made a series of fast paced advances into Eastcote’s half. Ben Williams made a pass to midfielder Piers Edgell who took the ball down the left wing, and making a reverse sweep, sent it flying in to the middle of the D, perfectly placed between the posts but landing up under the foot of striker Jamie Furness rather than on the end of his stick. Another good opportunity saw Jamie Furness take the ball to the right and towards to baseline, passing backwards to an unmarked Ben Williams who took the shot but the ball went just wide of the post. The Henley defensive line up remained solid as Eastcote pressed forward with a quick break. Responding quickly, Henley keeper Tom Grocock advanced on the winger and blocking his attempted cross, deflected the ball out for a corner. Further up field midfielder James Lane created a further opportunity on goal but his shot went wide. Another chance was created by Toby Phillips who dribbled across into the D and crossed the ball to Furness who pushed the ball just inches wide of the post. Henley were awarded some short corners early in the second half but the combination of an experienced Eastcote goalkeeper and a solid defence denied them a goal. Defender Nick Shuttleworth made a couple of silky runs up into Eastcote’s half, making some good passes into the D but Henley didn’t quite manage to collect them and send them goal-bound. Henley continued to thwart the hosts’ advances, but a quick Eastcote break in the final quarter of the match saw Henley’s defence outnumbered. Stepping up towards the advancing Eastcote player, Henley’s goal keeper was able to deflect the first shot out towards the baseline, but an Eastcote winger was perfectly placed and able to nudge the ball into Henley’s goal. Henley’s chance of securing a draw were looking diminished and it was only with the awarding of a penalty corner in the closing minutes of the game, that offered them the opportunity to put a goal on the score sheet. However, the slow ball never made it out of the D and despite a good shot from Shuttleworth, sending the ball screaming towards the backboard, the goal was disallowed.